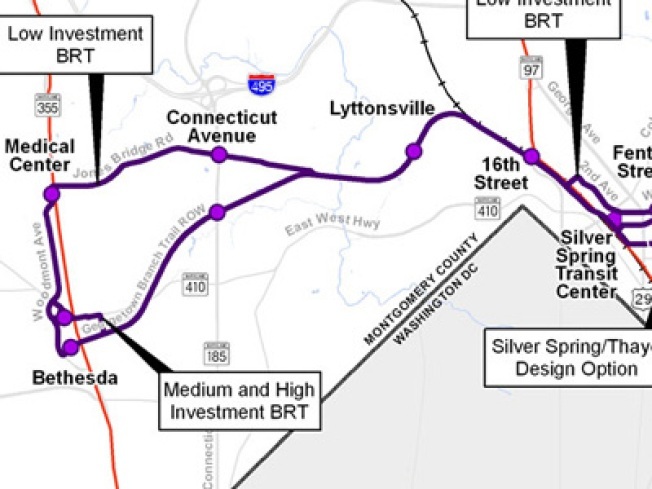 More bad news from Maryland Transit: Construction of the 16-mile Purple Line in Maryland is delayed again, and the price tag is higher. The Maryland Transit Administration told the Washington Examiner that construction won’t begin until 2015 – meaning the rail line won’t open until 2020. That’s four years later than earlier estimates. The price tag is now $1.95 billion, up from an estimated $1.5 billion in 2009. The project is delayed because the application process for federal funding has been more complicated and time-consuming than expected, the Examiner reports. The plan itself has changed, adding more expenses, and the costs also had to be revised to account for inflation. The proposed Purple Line has been decades in the making. Light-rail trains would run between the New Carrollton and Bethesda Metro rail stations. The line would provide an east-west connection for riders who use the Red, Green and Orange metro lines in Montgomery and Prince George’s counties.